Why HANA Cloud Platform from SAP? A colleague of mine asked for a document on this question and I could not find this specific one, so I decided to write it myself. Here is why you should use HANA Cloud Platform (HCP) and why from SAP (as there are alternatives in the cloud as we all know). Are you also keeping your money at home and hide it under the bed? Your business will need interaction over the Internet in the future. If it does not yet it will. That means you need ways to act securely with your company data over the internet with other people. To do so you either need to protect your data by setting up a complicated firewall infrastructure yourself and maintain it or have a trusted advisor connected to your environment who does this for you. Costs for running a data center usually has to be split in complicated calculations to the outcome of the production. Such it is hard to determine the binding between production and its cost. Same applies to software cost, by the way. By using SaaS you can associate the cost much more precise to specific actions and as you are paying for SaaS only as long as you are using it (and no upfront license cost) turn Capex into Opex. The least I expect is that they will give you a hug for this. Because Capex is what makes the lives of controllers complicated. Well, before making any statements I have to admit that I am working for this company and besides all odds, I’m still pretty proud of it (That’s the most positive judgement you can get out of an honest German, by the way). Let’s also make clear what that means. Infrastructure is all ground services that we are using such as machinery, operating systems, protocols, and other low level resources. All this is provided remotely (Service) and can be configured remotely. This is the biggest difference to classic hosting as we know it for several decades. Platform in general is a stretchy term. Some people call a database a platform. Some people call an operating system a platform. In a sense that you can do some kind on software on whatever you call you platform it also is. For SAP a platform usually means a business platform that includes all services needed for enterprise software. Anybody recalls the Fridge graphic back from 2004? Actually this still applies today, although the capabilities have changed dramatically. Now back to our first question. There are several vendors selling those services. Why should you use SAP? SAP always was a platform and a software company. Although it did do infrastructure all the time, it never was leading or willing to really compete in that market. There are always customers who preferred to run their software in an SAP data center (aka “hosted”) for different reason. For cloud it is a tough market. But at the same time it is even harder to make a platform that runs in any data center. So we started with a platform on our own data centers. Today this platform is called HANA Cloud Platform. 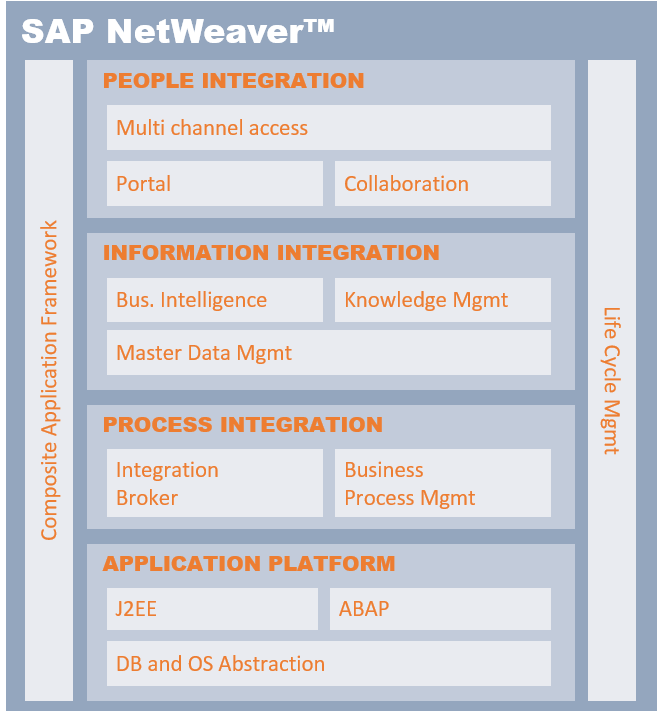 One of the things that SAP has a lot of experience in is how to produce an enterprise business platform. This experience went into HANA Cloud Platform. To be honest, I don’t believe that anybody else in the world knows better how to bind different business services together and how to produce them more effectively. For more than 10 years the split up of business services into micro services was a big thing (at the time called SOAP) and we did learn a lot in that time. What is also important is how to turn development into a durable service that is maintainable and pursuable. SAP delivers the tools for this and emphasizes the use of them. Surely you can collect those tools yourself, as many of them are available as open source today. The question is whether you want to collect all the experience that is needed for efficient use of them also by yourself and spend a lot of time and money by doing so. If we have learnt one thing about industrializing in the past nearly 200 years in history it clearly is that standardization of tools and parts is the way to effectiveness and cost reduction. SAP does know what an enterprise needs when it comes to services, what needs to be the parts of those, and how to make them efficient. This is why you should buy this stuff: experience. We could list loads of features that do this or that and actually my colleagues in product management will do this for you, because customers always ask for those. For the long run features are something that can always be implemented later also. And it is rare in the technology market that somebody has such a leap forward that it keeps them in front for a long time. Any decision based on such facts are obsolete a year later at latest.